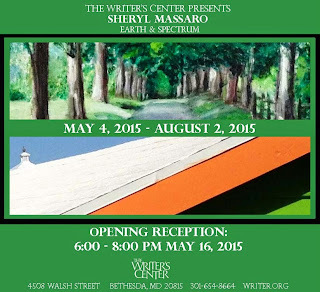 Experience views of Maryland from the sensitive perspective of visual artist and writer Sheryl Massaro. Meet the artist during an evening opening reception on May 16, from 6 to 8 PM. Sheryl Massaro is a Montgomery County native now thriving in Urbana in Frederick County. In addition to participating in numerous exhibits in Maryland, Virginia, and Pennsylvania galleries, as well as the Washington County Museum of Fine Arts, she has had solo exhibits locally of both art and photography. Her art, including oils, photography, and ceramics, is in private collections on the East and West Coasts. The Writer's Center hosts the work of artists to inspire an exchange between the visual and literary arts. Parties interested in purchasing a work on view may contact the artists directly. The Center does not make a profit on the art it exhibits.